Fresh from the Swanburne Academy for Poor Bright Females, 15-year-old Penelope Lumley reports to remote but palatial Ashton Place and discovers just why the advertisement for a governess indicated a strong preference for "Experience with Animals." 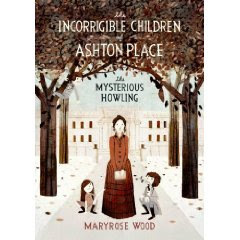 The three young children are not the offspring of disdainful newlywed Lady Ashton but were recently found in the forest, raised (apparently) by wolves. Lacking magical props but in every other respect a Mary Poppins in the bud, Miss Lumley quickly gets the wild but winning trio out of the barn and into the nursery, washed, properly dressed and thanks to a savvy strategy of "careful demonstration, a great deal of repetition, and the occasional use of tasty treats"on the road to civilized behavior. Tongue so forcibly in cheek that medical intervention may be required, Wood plunges her inexperienced but resourceful heroine into an unusually challenging domestic situation, winds the plot up and closes with an aftermath laced with tantalizing hints that All Is Not As It Seems.